Can scientists resurrect this extinct Galapagos tortoise? A team of researchers is trying to bring the extinct Pinta tortoise of the Galapagos Islands back to life - here's how. You may remember Lonesome George, the Galapagos tortoise who died in 2012, representing the extinction of an ancient species. 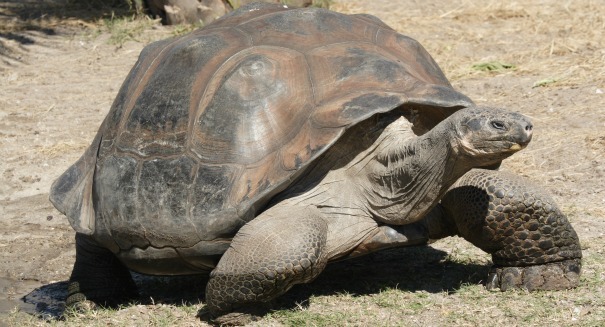 According to a report from Discovery News, however, the Pinta Galapagos tortoise may not be extinct for long. Researchers at Yale University are attempting to use genetics to resurrect the fallen species. Lonesome George was the last tortoise on the Galapagos Island of Pinta in 1971. He was discovered by researchers who moved him to Santa Cruz Island, where he spent his remaining 41 years. Despite repeated attempts, Lonesome George was unsuccessful at mating and passing on his species’ genes. He was the last of his kind. George’s death was regarded by conservationists as an example of the fragility of certain species, and was used as an argument for increasing efforts to preserve habitats for rare animals. Now, researchers think that the Pinta tortoise is not lost forever. Tortoises living on Isabela Island, located south of Pinta, were discovered in 2008. A genetic analysis of the tortoises discovered on Isabela Island revealed striking similarities to the DNA of the Pinta tortoise. Researchers began to wonder if they would be able to successfully recreate the extinct species of Pinta tortoise using DNA from their close cousins on Isabela Island. It was possible that some of these tortoises even shared a common ancestor with Lonesome George. Researchers are planning on breeding the tortoises found on Isabela Island to exhibit as much Pinta DNA as possible. Bred in captivity, these new tortoises could once again wander Pinta Island, hopefully setting up new populations. Researchers believe that it will take just a few generations before the new tortoises would be near identical matches to Lonesome George. The Pinta tortoise helped spread seeds around the Island, keeping it lush and diverse. With new tortoise populations looking like a real possibility, the Island could once again bloom and become a shining example for the wonder of evolution. More information about the Galapagos Tortoise Restoration Project can be found here.